A company from Surrey whose slogan is “Waterproof gear for beach, board and life” has launched its first range of bike gear; panniers for front and rear plus a handlebar bag. 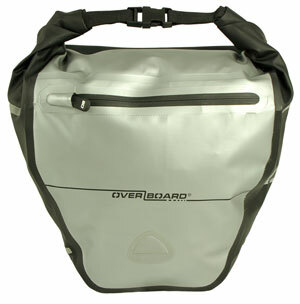 OverBoard, a manufacturer of waterproof travel and sports gear and an official kit supplier to the Royal National Lifeboat Institution (RNLI) has announced a range of waterproof bike panniers designed to fit on a front or rear rack. 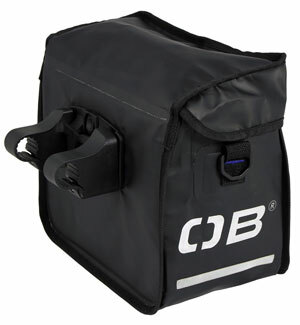 There is also a handlebar bag that attaches with a modern-style click-lock bracket. Made from tough PVC tarpaulin, the new bags are 100 per cent waterproof, according to OverBoard. 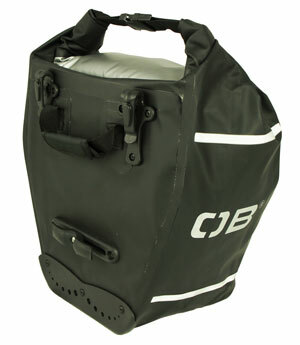 The simple roll-top sealing system and electronically-welded seams provide 100 per cent protection even for quick submersion in water and each pannier has a tough and hard base plate for further protection of the contents and the bike. The 6-litre Handlebar Bag, 12-litre Front Wheel Pannier and the 16-litre Back Wheel Pannier each have an internal zip pocket and there’s a detachable shoulder strap for the ‘bar bag. Available only in a neutral light grey fabric colour, there are reflective front and side patches. We haven’t tried the bags yet but OverBoard assure us that the panniers’ quick-release clip system is compatible with most standard bike rack systems.